Symantec utilities are well-known security software. 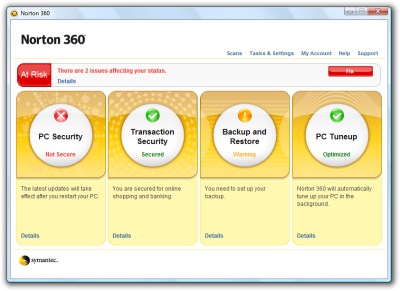 However one of them, Norton 360, is not only security software. 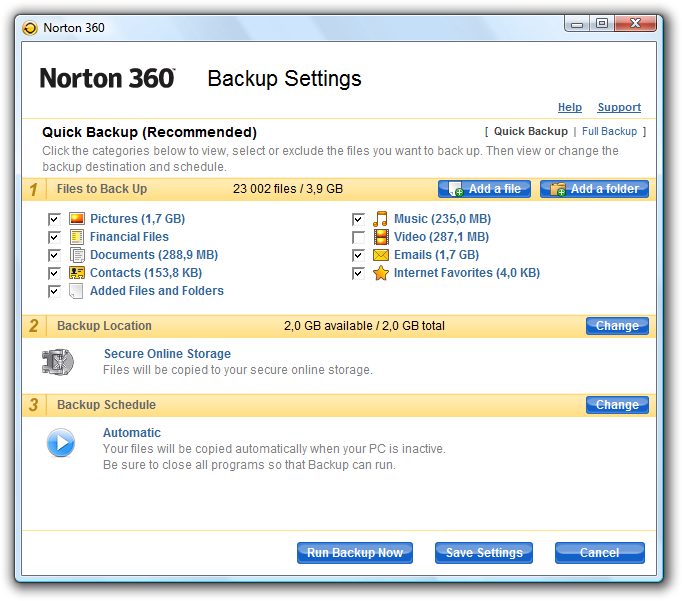 It is also a backup utility with ability to store your backup data using secure online storage. You can easily backup your pictures, documents, contacts, music, videos, emails, internet favorites and other files or folders. You have 2 GB space for your online backup, not too much. However you can backup to another disc or burn your data backup onto a CD/DVD too. So at first you need to run Norton 360 application. The easiest way is to click on its link on your Windows Desktop. 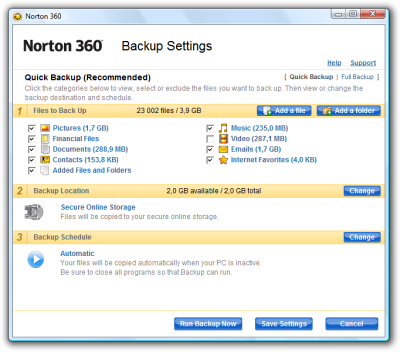 After the Norton 360 starts, click the Backup and Restore button in the application’s window. 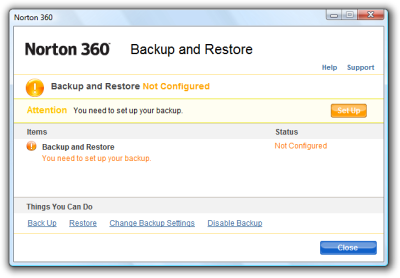 If you have not backup using Norton 360 yet, the application tell you that you need to set up your backup process. Take a look at the bottom of the window and click the Back Up link. You should see a Backup Setting window now. There are three steps you should do. Select what you would like to back up. Check the size of selected items. Then click on the blue button called Change for backup location settings and in a dialog select Secure Online Storage. 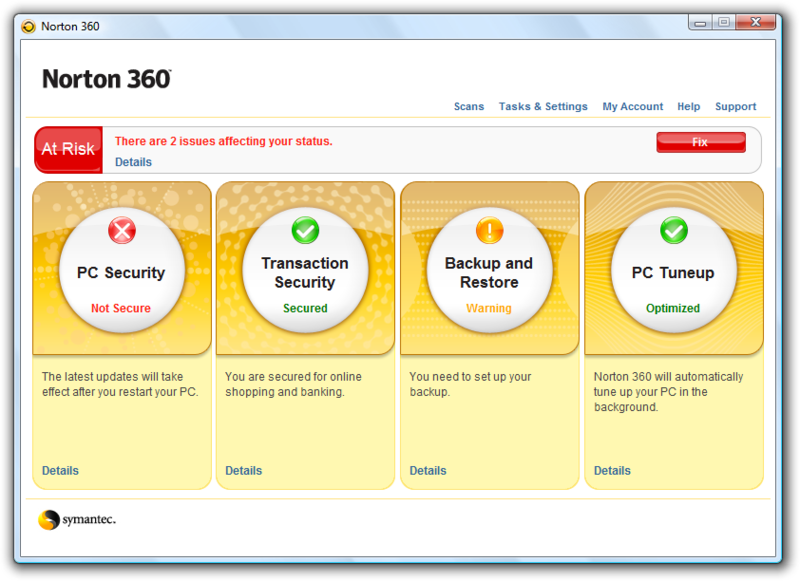 If this is your first use of Norton 360 and Secure Online Storage, you will be prompted for your e-mail and password for a Symantec account. After that you could use a Change button for setting up a backup schedule. If this is your setting for usual backup, don’t forget to save this setting – just click the Save Settings button. You are ready to start your online backup now. 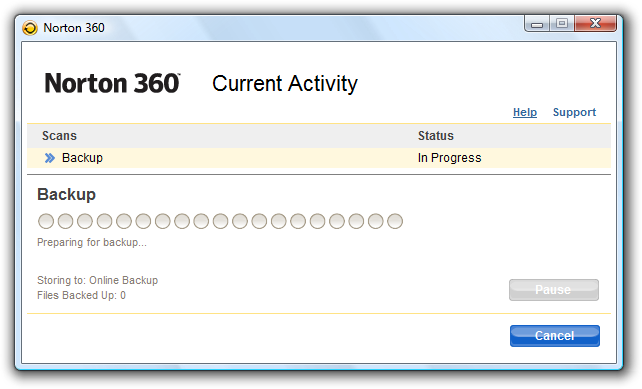 Click the Run Backup Now button and wait for completing the backup process. How long it will take? It depends on a size of your files for backup process. How to restore your files? I hope your computer and system will work well for a long time. However something wrong could happen anytime. 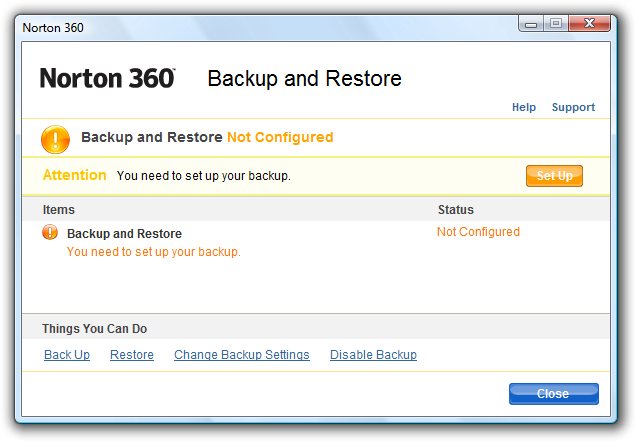 So if you need to restore you backup, run the Norton 360 window, click Backup and Restore button again and then click Restore link. The rest is similar to backup process. Select items you would like to restore, click the Restore Now button and wait until it’s finished. 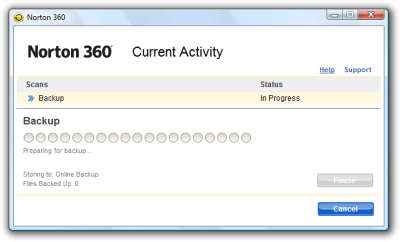 Norton 360 is interesting backup/security software. With Secure Online Storage it has a bonus value to its standard functions. Online backup is very comfortable process and if you select only very important items, the 2 GB size should be enough for your needs.